The Model 575S level transmitter carries CSA approval and is ideal for environmental applications such as water wells, holding ponds, lake rivers, and chemical tank level measurements. The Drexelbrook Model 575S is an intrinsically safe submersible pressure transmitter ideal for liquid level measurement in Class I Div. 1 hazardous locations. 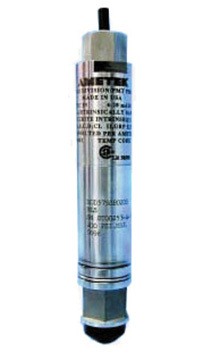 This two wire submersible level transmitter is constructed of a 316SS body with 316SS or optional Hastelloy diaphragm. Its rugged body provides excellent environmental protection and the non-clogging, removable snubnosed end protects the sensing diaphragm while saving maintenance. The Drexelbrook 575S indicates the level of liquid by continuously measuring hydrostatic pressure via its sensing element, an ion implanted silicon semiconductor chip with integral Wheatstone Bridge circuit. Data is transmitted by a 4-20 mA output with an accuracy of 0.25% of range span, on static head pressures up to 690 ft.
Waterproof cabling is available in continuous lengths up to 5000 ft along with lightning protectors. • Popular measurement ranges up to 690 Ft.